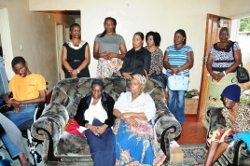 CEC has rendered support to the Sakala family of Kitwe’s Kawama Township, struck by a mysterious disease that has left four family members paralysed as well as speech and visually impaired. 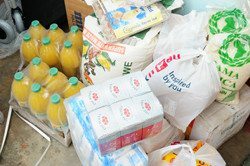 The donation included two wheelchairs, assorted foodstuffs and groceries, monetary support as start-up capital for an income generating activity as well as support to two school-going children, all valued at K25,000. The donation was an initiative of the female employees of CEC who led the intervention in response to a recent media report that brought to the fore the plight of the family afflicted by a strange, debilitating and incurable disease. Coinciding with the 2018 International Women’s Day, the act of philanthropy was a practical application of the theme “Time is Now: Rural and urban activists transforming women’s lives” which called for enabling acts to help women claim their rights and realise their full potential. 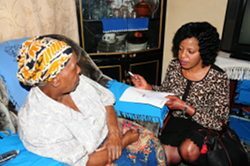 The family, headed by their elderly mother, Regina Sakala, 74, has for more than 20 years had to deal with the effects of what seems to be an incurable disease that has claimed the lives of some family members including her husband. Now, four of her children are affected. All are above the age of 30 and two of them once had thriving careers as teacher and secretary respectively before becoming bedridden. 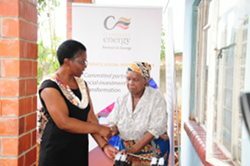 Senior Manager Project Finance, Lizzie Muwowo, who led the team of CEC women in presenting the support, commended Mrs Sakala for her tenacity in providing and caring for her family under very difficult circumstances, describing her resilience as rare and inspiring. “As women and mothers, we can easily empathise with you in this desperate situation because we know from experience that in any home, women bear the disease burden as the primary care givers to the sick,” said Muwowo. She stated that every parent’s desire was to see her children grow into productive and independent beings whom a parent could rely on later in their lives but observed that when such a natural path of life was, in a way, distorted, it could be an overwhelming and depressing experience. “Mrs Sakala’s resilience and perseverance to attend to her family under very difficult circumstances is rare and inspiring. Not many can carry such a burden for as long as you have done,” Muwowo said. In what seems to have become a regular yet painful tale, Sakala recounted with grief how her children’s health begins to steadily waste away before her own eyes while she is left with little hope for a solution to her predicament. In a moving word of gratitude, Sakala thanked CEC for the gesture. She said that life had been very difficult for her family and that any support rendered made the burden much lighter.